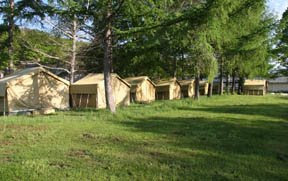 I headed the committee that purchased twenty Pinnacle tents for our meditation center. We've used tents for a number of years and have lots of experience -- some of it very trying. The last batch of tents we tried barely lasted through the season. That's when we found Pinnacle. We noted numerous benefits in using Pinnacle's #644 tent: larger windows, better zippers (bigger and stronger), heavier floor -- the list goes on. And, the extended rain fly helped keep out the undesirable weather (we get lots of it in New England -- our tents are up from May to September). And, any questions, concerns and the like have been handled quickly and efficiently. It's been a real pleasure to work with Pinnacle. Labels: Canvas Tent, Canvas Tents, Canvas Wall Tent.